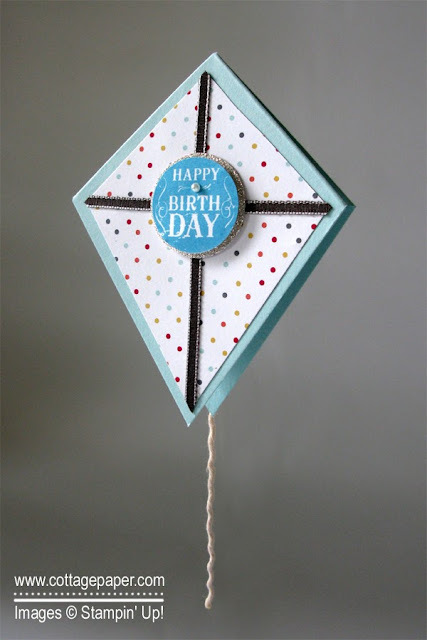 Last spring I made a kite card for the birthday of one of my granddaughters. During the time I was making this card another of my granddaughters was visiting. 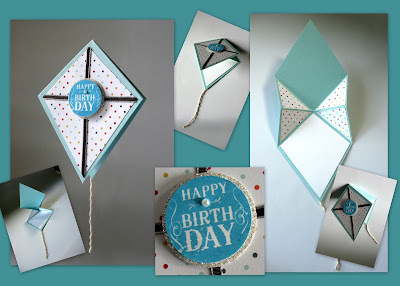 She was intrigued by the card and ask me if I would make a kite card for her birthday. I said of course! Her birthday is coming up and here is the card I made for her. With the correct dimensions in hand, kite cards are not really difficult to make - certainly much easier to make than they are to photograph! Start with a 10" X 4" piece of cardstock. Score it at 5". Then put a small pencil mark at 3" and 7" along the two long sides of the card and at 2" along each short side. Then score from each 3" mark to the 7" mark on the opposite side as shown by the dotted lines. Since you are scoring on a diagonal line it is difficult for your eye to line up the grooves of the Simply Scored. I find the easiest way to do this is to put a piece of removeable tape (love that stuff!) down one of the groves in the middle of my Simply Scored. Then line up two of the small pencil marks making one leg of the X along that groove. The tape helps you make sure the groove at the top mark is the same groove as at the bottom mark. You can also do this with a bone folder and a straight edge. Fold the center score of the card backwards so right sides are together and burnish with a bone folder. Open the card flat. Then crease forward each of the score lines that create the X and burnish each one. Once all score lines have been done, fold the card closed pushing the side pieces inward. Your piece should now resemble a house. 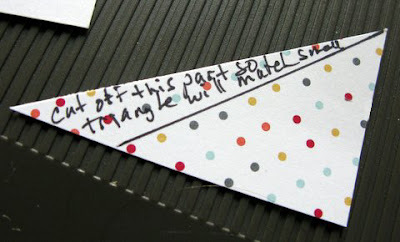 Cut off the triangle pieces by cutting from the 3" (or 7") mark to the 2" mark in the center of the bottom of the of card. If you cut through both front and back layers at same time the front and back layers should line up when closed. Make a tail out of Baker's twine or string and attach it to the back of the card. I used some retired Stampin Up! Rope Twine that I untwisted and then attached a strand of the twine with Glue Dots. To create a piece of DSP to attach to the front and triangles to attach inside folded pieces, cut a piece of DSP 4 1/2" X 3 1/2". Keep in mind that you may want to use a piece that does not have a direction. Score at 1 3/4" along the 3 1/2" side and fold it down the middle. Along the 4 1/2" side place a mark at 1 3/4". 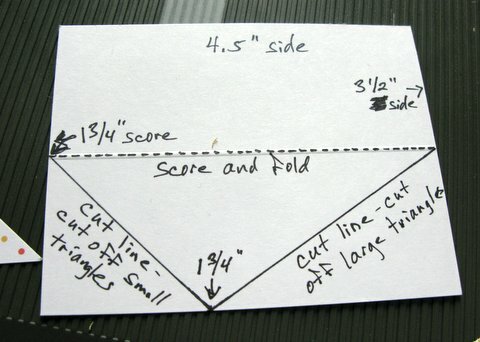 With the DSP folded along the score line cut through both layers from the mark to one end of the fold as shown in the photo, cutting off 2 triangles. Then cut from the mark to the other end of the fold, cutting two more triangles as shown. You will now have a kite shaped piece to attach to the front of the card. I also cut a 2nd kite shaped piece out of another piece of DSP using the first piece as a template. I attached this 2nd piece to the back of the card over the kite tail. I cut another piece from Whisper White cardstock and attach it to the inside of the card for my message. 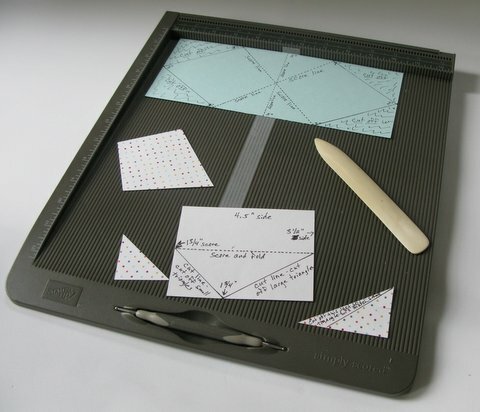 Using the 2 smaller triangles as templates, cut the larger templates to the same size as in the photo. Attach the DSP triangles to the card as shown. Embellish as desired.